Salmon is one of my favorite go-to weeknight mains – it doesn’t take long to marinate, it cooks quickly and as a bonus I can save a dose of my Omega-3 supplements… The main reason I cook it during the week though is it’s not something I usually order out. I’m going to try to say this without sounding like a giant food snob, but most salmon served in restaurants is farm-raised, which means it ate GMO corn and soy, was injected with dye to make it pink and doesn’t have near the Omega-3s it should. It can also be higher in mercury. I sound horrible, don’t I? But you know, when you start connecting the dots between what you put in your mouth and how you feel in your body you take this stuff a lot more seriously! I always say, eat like your life depends on it… because it does! What’s scarier is GMO corn and soy and food dye could one day be the least of our worries if frankenfish become a real thing. Yikes! So then you can imagine how excited I was to see wild Pacific-caught salmon on just about every menu I opened on our California road trip last month. I must have had salmon four times that week. And holy… was it good. I swear, looking at the ocean while I ate it made it taste even better. When I shop for salmon, Pacific is what I look for because it’s less exposed to mercury so has lower concentrations of the toxic metal that can be a concern in larger fish. I can usually find it at the store either fresh or frozen. Wild is a bit pricer so to help offset the cost you can always opt for frozen which is usually less expensive. That’s typically how I buy my fish anyway. It’s easy enough to thaw and, hello, we live in Texas; most of the fish behind that glass was frozen not to long ago too…. Salmon is one of the best sources of Omega-3 fatty acid, an essential nutrient our body needs to regulate inflammation. Omega-3 is something to be conscious about adding to your diet if you have any sort of pain, stiffness or swelling. People who suffer from joint pain report great results and relief (myself included) from supplementing with fish oil and other Omega-3 supplement sources like cod liver oil and krill oil. It’s also been shown to help reduce the risk of heart disease and Alzheimer’s. Of course it’s always best to get your nutrients from your food, that’s why I try to have salmon at least once or twice per week. And this recipe is one of my all time favorites. I love the combination of dill and mustard. I know it sounds like dressings for a hamburger but I suppose there’s a reason those condiments just work so dang well together. 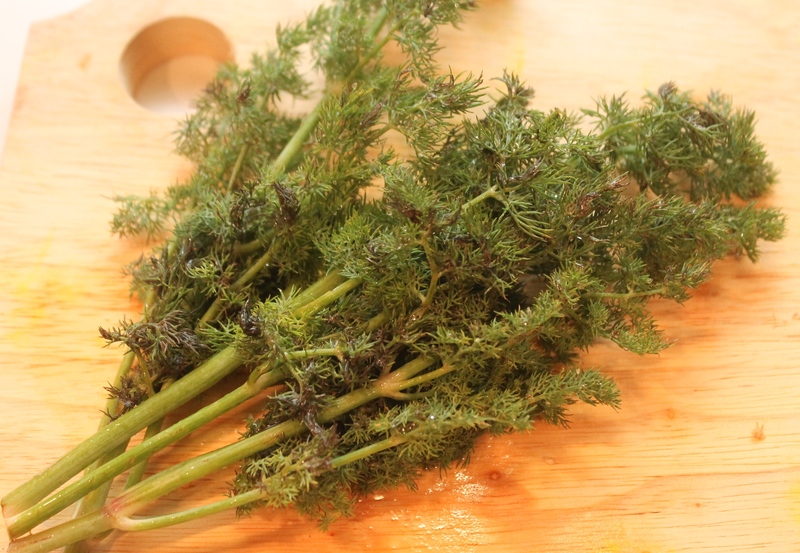 This is great with sautéed vegetables like dark leafy greens, squash, zucchini and onion. Or for something a bit lighter you could serve on top of a spinach salad with fresh raw, thinly sliced veggies like carrot, celery and radish. Enjoy! 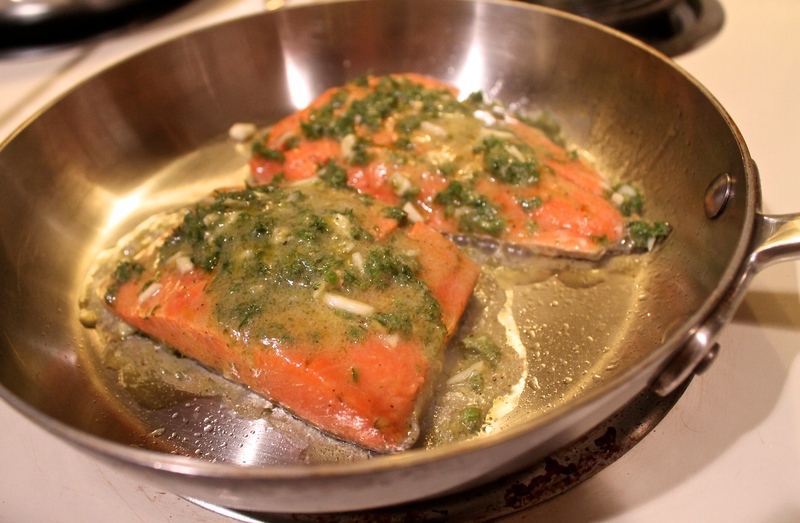 To marinate salmon, place salmon filets in a glass container or gallon-sized plastic bag. 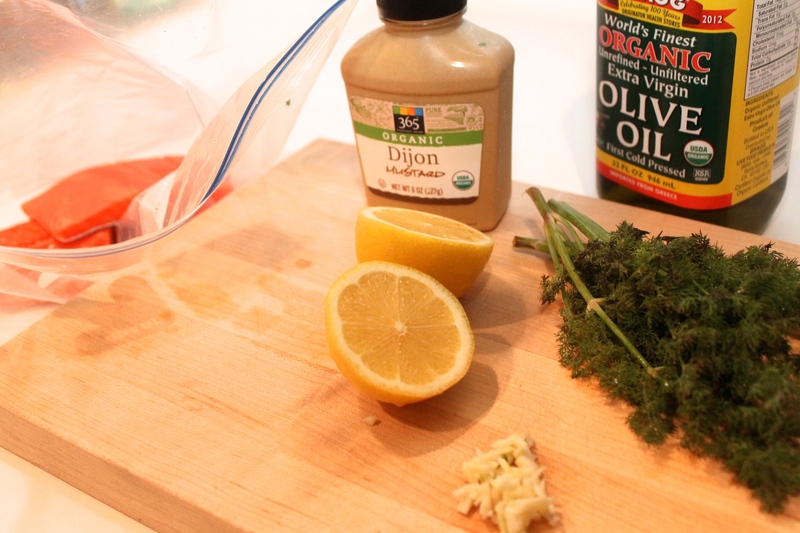 Combine lemon, olive oil, dill, dijon, salt and pepper and then pour marinade over salmon. Mix well to coat the salmon filets and then set aside in fridge to marinate at least 30 minutes. When ready to cook, heat a skillet over medium heat. Pour salmon and marinade into skillet and cook salmon 4 minutes on each side. Serve with sautéed spring vegetables like zucchini, squash, asparagus, peas, etc.